Room ID Flag Systems Clearly Identify Room Availability. 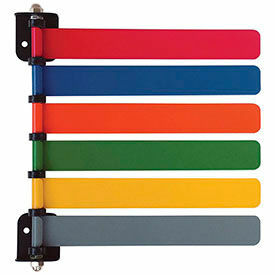 Room ID Flag Systems are made of steel for long lasting durability. Flag systems are used by medical facilities and more to alert staff to room availability, guide visitors properly and protect patients. Swings for ideal viewing from various locations. Room ID Flag Systems can be rearranged by color. Flag lengths available in 4-1/4" and 8-1/4". ID Systems available including 1 flag up to 12 flags. Assorted colors available.